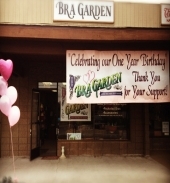 Kathy Zutz: Bra Garden is a specialty bra and mastectomy shop. Our Warm and inviting store provides all the needs of our local community’s women. We are located right on the border of Fountain Valley (A huge business area with names such as Kingston Technology and Hyundai calling it their HQ) and Huntington Beach (Surf City, USA). As such, our clients are as diverse as they can come! We are located freeway close, but with a neighborhood feeling. After a cup of hot tea, our customers enter our large and comfortable fitting rooms. Much of the furniture in the store is antique or at least antique feeling, which our older cliental loves! We specialize in the bigger cups, DDD-N, however we fit anyone who comes in. If they happen to not fall in our size range, we do keep a smaller stock of smaller sizes. If they still can’t find anything, we will even special order right then and there. We also care lines of beautiful and comfortable pocketed bras, compression garments, and many shapes and sizes of breast forms. When we have that client, our facility is up to Medicare standards and we can accept their insurance. Kathy: Our store offers reasonable pricing on high quality bras and we never charge for a fitting. Most of our clients are repeat and referral clients, which say wonders for our customer service as well. Our name ends up going through offices like wildfire and we see spurts of one office showing up within days. Our location is sadly void of professional fitter and as such our “competitors” are far enough away none of us fight for location. This allows us to work hand in hand with any area stores and that, of course, offers even better service for all! Kathy: We look for durability and construction in a brand. We are also very cost conscious. We keep our main stock prices below $80. However, we do keep relationships open with the high end bra companies so we can order if the customer wants them. Though we have many brands to choose from, we do a lot of business with most of the Evenden lines (Freya, Elomi, Goddess, and Fantasie), Wacoal, Anita and Panache. In our surgical care, we use American Breast Care bras and forms, Anita Care bras and forms, and Wear Ease compression garments. When researching venders, we of course look at their size range. Since we start where most bras stop (around the F cup), that is our biggest concern. We need the band range to be as diverse. Our clients will offer suggestions as well, and that is how we recently picked up Aviana Bras. We also look for vendors that will listen to suggestions about how American women are fitting into the bras. It seems difficult to find underwire bras in those sizes that won’t stick up too high in the underarm for the shorter stature American woman. Kathy: I have been in the bra business so long, I have seen styles and trends come and go. Currently, the clothing industry has made it so many women are looking for the beige t-shirt bra. Smooth, seamless, molded cup. Our younger generation, which was shopping at the mall bra stores, are looking for all that and with a push up. Every so often they like to add some color or print to that, but typically nay any embellishments with the concern it will show though thin shirts. Kathy: We keep our prices hovering around the $50/$60 range. They do very on either end by $10 to $15, but as stated before, we don’t like to break $80, unless that customer wants that bra in particular. We typically say our size range is 28-52, DDD-N. We basically want to cover the sizes not available in our area, so we typically try to keep the 28-40 band size mixed with DDD and above, and the 42 and above we try to start at A and work our way to N. We fit and give everyone a size they can take anywhere they would like. With all the vendor relationships we have, we do special orders for any bra and size you could want! Our number one average size right now is 38G, followed by 36G. The top four sizes we are selling are 32, 34, 36, and 38G. And most of those women came in the D’s! Kathy: Our customer typically leaves with about two bras to get them started. That averages out to around $120 a visit. With the right sale, our customers can leave with around 3 bras for that same price, or they can come in and scoop up 6 bras or spend $400 to $500. Since we are in a very family filled area, we get a lot of mother/daughter/grandmother duo’s and trios. That helps drive up our average as well! Kathy: Our customer base is highly diverse because of the area we are in. We fit elderly ladies with wonderful stories of their life they share with us, down to teenagers who are a little shy and need some guidance on how to care for themselves (after all, to them, their parents know nothing..) Also, though I wouldn’t consider them part of our customer base, we get many husbands to be the one who see our ad or store and drag their wives in to be fit! Kathy: We are here to help anyone and everyone who needs our help! We are all about peace, love, and happiness, and hope that everyone who walks in can feel that. We love first name basis and being a part of their families. Many times, we have driven to our customers at their home or hospital if it easier for them. We also love to support any US women business owners for any of our made in America knick-knacks.